Bicycle-friendly amenities are contributing to a surge in property values in communities across the globe, marshaled by developments in urban centers and suburban outposts that accommodate “active” transportation. 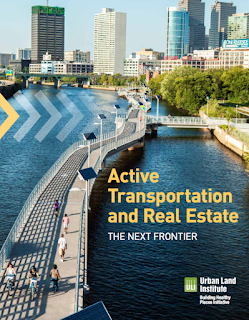 “Today, bike trails, bike lanes, bike-share systems, and other forms of active transportation infrastructure are helping spur a new generation of ‘trail-oriented development,’” states a recently released report by the Urban Land Institute (ULI) that profiles 10 such developments. The report, “Active Transportation and Real Estate: The Next Frontier,” cites a considerable statistic: on a national scale, the values of homes in areas with “above-average” access to active transportation are higher than those of comparable properties by as much as $34,000. Homes in proximity to the bike-able Indianapolis Cultural Trail, for instance, have seen an astronomical rise in value since the trail’s opening six years ago—148 percent, the report states. In Radnor Township, Pa., the Radnor Trail has raised the values of properties within a quarter-mile by an average approaching $70,000. Similar trends have also emerged in Atlanta and Dallas. The draw to these trails, or networks, is primarily enhanced well-being, with the increased sense of safety—made possible by features like graded paths, protective posts and “bicycle boulevards” —especially appealing to bicycle commuters, who contend with motorists daily. The opportunity for outdoor physical activity has also markedly peaked interest. Beyond those benefits, bicycle networks can lead to a reduction in air pollution and vehicle greenhouse gas emissions. The Department of Transportation claims half of all trips taken in the U.S. are less than three miles long—a 20-minute ride by bicycle, according to the report. The Fairfax County Department of Transportation in coordination with the Fairfax County Park Authority is holding a design public hearing on a pedestrian improvement project for Scott’s Run Trail on Tuesday, November 15, 2016. 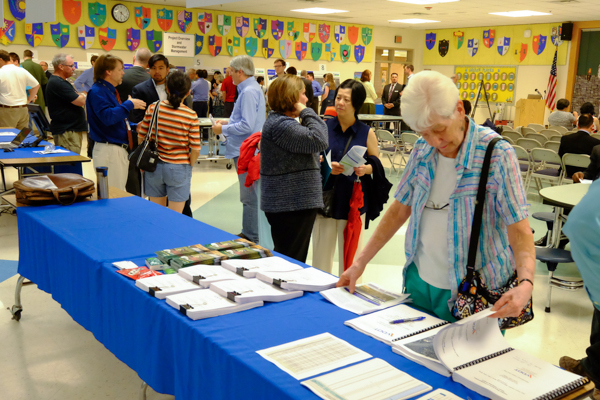 The meeting will be held at the Westgate Elementary School, 7500 Magarity Road, Falls Church, from 6:30 pm to 8:30 pm. 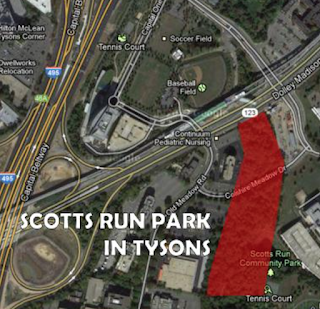 The proposed project plans to provide a new pedestrian walkway through Scott’s Run Park. This new walkway will include two bridges and lighting along the trail alignment. 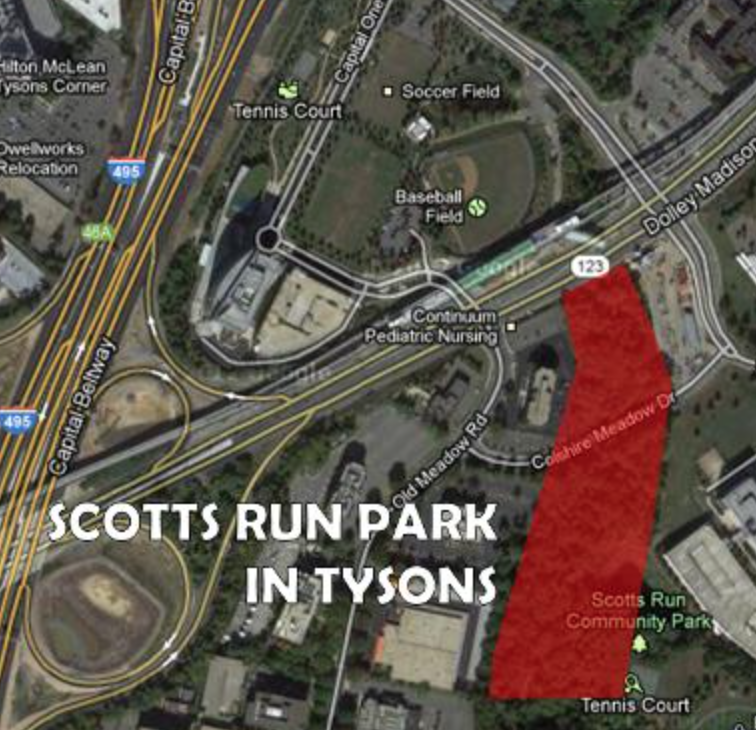 Scott's Run Park--not to be confused with Scott's Run Nature Preserve--will be almost 2.9 acres of naturalized trails and overlooks that pass through the Scott's Run stream valley near the McLean Metro station. The formal presentation will begin at 7:15 pm but people are encouraged to arrive earlier to view project plans and learn about the proposal from project team members who will be available to answer questions. Project information also can be found at the project website here. 25 November 2016, to Ms. Elizabeth Cronauer, Project Manager, Fairfax County Park Authority, 12055 Government Center Parkway, Suite 406, Fairfax, VA 22035. You also may e-mail comments to Elizabeth.Cronauer@fairfaxcounty.gov (include “Scott’s Run Trail” in the subject line). FCDOT is holding a public meeting on Monday, November 14 to gather input on various proposals to improve traffic safety, bicycling, and the pedestrian environment in Reston. The following selected street segments are based on VDOT’s proposed 2017 Repaving Schedule. The proposed improvements are limited to changes that can be made with roadway striping as part of the repaving process. This is your chance to support better biking in Reston. There is very little cost to the county to improve safety for bicyclists, pedestrians, and motorists. The bike lanes on Lawyers Road and Soapstone Drive were an outcome of repaving projects. Please consider attending this meeting and supporting the county's efforts to make biking safer and more convenient in Reston. The Hunter Mill Land Use Committee, a volunteer citizen advisory group that serves county neighborhoods outside of Herndon, Reston and Vienna, has several volunteer positions open. A background in land use and planning is not necessary to be a member. But, the committee is a voice for citizens with developers to encourage the building and maintaining of infrastructure that promotes safe, active, and healthy living through better places to walk and bike. If you are interested in or have questions about joining the committee, please contact Supervisor Cathy Hudgins' office at 703-478-0283, TTY 711, or at huntermill@fairfaxcounty.gov. VDOT and the Town of Herndon are planning to widen Elden Street from downtown at Monroe Street east to Fairfax County Parkway. Bike lanes are proposed from Monroe Street east to Herndon Parkway, then "off-street bike lanes" to Fairfax Co Parkway. The off-street bike lanes appear to be one-way cycle tracks on each side of Elden Street. To learn more about the project and speak out in support of bike facilities on Elden Street please consider attending the design public hearing on Thursday, October 27 from 6:30 to 8 p.m. at the Herndon Senior Center, 873 Grace Street, Herndon, VA 20170. We think the proposed 12-foot travel lanes are much too wide. In an urban setting with slower speeds and bike/ped traffic, 10-11 foot lanes are more appropriate. Traffic signals at the intersections need to sense the presence of bicycles, and there needs to be seamless connections to the Fairfax County Parkway and Sugarland Run Trails. This project will widen East Elden Street (Route 606) from four to six lanes between Herndon Parkway and Fairfax County Parkway in the Town of Herndon. The purpose of the project is to reduce traffic congestion, improve safety and enhance access to and from Fairfax County Parkway. Mark your calendars to join FABB in welcoming Dranesville District Supervisor John Foust for a discussion of bicycling and related transportation developments and needs at our November meeting. The meeting will be held at the McLean Governmental Center on Wednesday, November 16, from 7:30 to 9:30 pm. This is the last in a series of meetings in 2016 in venues around the county. Because of the extensiveness of Dranesville District, November's meeting will focus on the areas around McLean, Tysons, and Falls Church. Adam Lind, the Fairfax County Department of Transportation Bicycle Coordinator, will also be there to talk about current and future bicycling projects in the southern part of the district. FABB plans to have a separate meeting in early 2017 to cover developments in and plans for the Great Falls and Herndon areas of Dranesville District. The McLean Governmental Center is located at 1437 Balls Hill Road in McLean, near the intersection of Route 123 and Lewinsville Road. Please help spread the word about this upcoming meeting to talk about ways to make bicycling better in this area. VDOT is holding an important design public hearing on the widening of Route 7 on Tuesday, Nov. 15 at Colvin Run Elementary School at 6:30 p.m. Between Reston and Tysons there are no continuous bicycle or pedestrian facilities. This project includes shared use paths on both sides of Route 7 from Reston Ave. to the Dulles Toll Road. It will connect with existing trails on both sides of the project, including the widening of the Route 7 bridge over the Toll Road that includes grade-separated crossings of the Toll Rd ramps. It's important that bicyclists and pedestrians attend this meeting and speak out in support of the shared use paths. If you can't attend you can send comments to ConnectRoute7@VDOT.virginia.gov. Please reference "Nov. 15 Design Public Hearing" in the subject line. Stop by between 6:30 p.m. and 8:30 p.m. to view displays and learn more about the project. A brief presentation will begin at 7 p.m. The project team will be available to answer your questions. The design public hearing is an opportunity to learn more about the Route 7 widening and corridor improvements as the project moves toward design approval, and to view and comment on the draft of the recently completed Environmental Assessment. Information on the project's proposed schedule and potential delivery methods will also be available. This is a formal meeting where written and oral comments may be given to the project team and court reporter. The team will review and consider all comments received at the hearing. A summary of the comments received along with responses will be posted to connectroute7.org. Give your comments at the meeting, or submit them by December 2, 2016 to Mr. William Dunn, P.E., Virginia Department of Transportation, 4975 Alliance Drive, Fairfax, VA 22030, or email ConnectRoute7@VDOT.virginia.gov. Please reference "Nov. 15 Design Public Hearing" in the subject line. Past meeting resources, including questions and comments received at the June info meeting, with responses from the project team, are available at connectroute7.org. What a surprise to see Al Roker of the Today Show promoting biking in a short 14-second TV ad during Meet the Press this morning. "[Drawing of a car] This costs you money and runs on gas. [Drawing of a bike] This saves you money and runs on calories. Save the car for rainy days and long road trips. Biking is better for your body and your budget." The ad is part of The More You Know campaign sponsored by NBC Universal "focused on education, diversity, health, civic engagement and the environment." Kudos to Al and NBC Universal for airing the ad. "America's favorite meteorologist Al Roker and The More You Know campaign want to remind you that biking is better. Biking instead of driving can help improve your body and your budget. Leave cars for road trips and rainy days and opt for a bike to burn calories, not gas." I googled Al Roker Biking and discovered that Al is a bike commuter. He rides a Brompton folding bike 4 miles to work each day. He even ignores his advice about above about saving the car for rainy days; in this Youtube video from a Weather Channel interview it looks like he is biking in the rain. You go Al! What New Bicycle Facilities Are Needed at Lake Accotink? This is your opportunity to provide the park authority with comments and suggestion about what bicycle facility improvements you would like to see added to the park. Some possible suggestions would be a tire air station, adding bicycle signs and safety markings to the access road, and designating an area for a bicycle safety "school". Proposing bicycle needs and improvements at informational meetings is the first step in getting items included in a park master plan. If you have suggestion for bicycle improvements at Lake Accotink, please attend a Fairfax County Park Authority hosted community workshop on Thursday, October 27, 2016, to help determine the kinds of facilities and programming the community finds most valuable. Members of the public are invited to stop by Kings Park Elementary School between 7 and 8:30 p.m. Participants can move at their own pace through a series of workshop stations that will help to clarify the types of facilities and programs they feel are most important. Participants should allow about 30 minutes to answer the workshop questions. Park Authority staff will provide a brief update on the overall project at 7 p.m.
Kings Park Elementary School is located at 5400 Harrow Way, Springfield, Va.
For more information, visit the Lake Accotink Park Master Plan Revision page. Today marks a milestone for biking in Fairfax County with the launch of Capital Bikeshare in Reston and Tysons. The system was officially opened at 5 a.m. today. At 2 p.m. dignitaries gathered at the Wiehle-Reston East Metro station to cut the ribbon on the system. 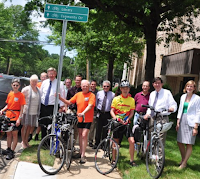 Congressman Connolly, Delegate Plum, Chairman Bulova and Supervisor Hudgins all talked about the importance of bike share as an integral part of the county's transportation infrastructure. County bike coordinator Adam Lind gave some background on the development of the system. The weather didn't cooperate very well but the system is now in service. This morning we took a tour of the system, checking out bikes from each of the 9 Reston stations. Several stations have not been installed yet. 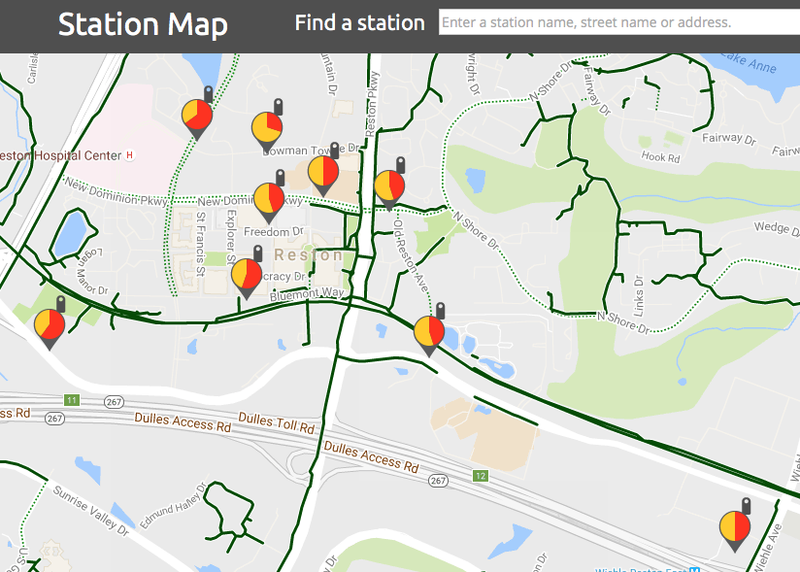 All 15 Reston stations should be in place by the end of November. Half of the 14 Tysons stations are in place. See the Capital Bikeshare Station Map for details. "Capital Bikeshare is a terrific and innovative transportation program," said Fairfax County Board of Supervisors Chairman Sharon Bulova. "I am pleased Fairfax County has officially joined the Capital Bikeshare network to support a fun, healthy and sustainable way of getting around the region. Capital Bikeshare will also give residents and visitors a new opportunity to explore Fairfax County's bicycle trail network." Fairfax County becomes the fifth jurisdiction in the National Capital Region to join the Capital Bikeshare system, bringing the total number of stations to 435 across the District of Columbia, Arlington County, City of Alexandria, Fairfax County, and Montgomery County. There currently are 9 stations in Reston and 8 stations in Tysons with several more to be installed this November and December. "As Hunter Mill District Supervisor, I am really excited to be part of the Capital Bikeshare network," said Supervisor Cathy Hudgins. "Fairfax County has worked very hard to shape a network for all modes of transportation in Fairfax County and this is a substantial step in the right direction. Specifically in Reston, the community has always been on the leading edge for transportation and the expansion of Bikeshare in our community will continue this tradition," she continued. 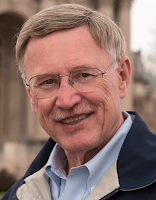 "Adding Capital Bikeshare to Reston's transportation alternatives makes us a complete community," summarized Delegate Ken Plum. While reducing congestion and improving air quality, the county's Bikeshare network serves work, recreation, retail, residential and transit destinations, with stations located within close proximity to the Silver Line Metrorail stations in Reston and Tysons. "Today's ceremony is further proof that the type of development we built the Silver Line to spur is coming to fruition," said Congressman Gerry Connolly. "Both in Reston and in Tysons we are seeing the emergence of a new, sustainable urban landscape. I am very pleased that Capital Bikeshare is expanding further into Northern Virginia and look forward to more announcements to come!" When I-66 is widened outside the Beltway, most of the bridges crossing I-66 will be rebuilt. When VDOT designs the new bridges, they use Fairfax County plans to determine number of lanes and what type of bicycle and pedestrian facilities to include. The current Transportation Plan does not include widening of the existing two-lane bridge. The county would like the bridge widened so they have initiated the process of updating the plan under Plan Amendment 2016-II-T2. For details see Staff Report for 2016-II-T2. Fortunately the Bicycle Master Plan (SW section map) does call for bike lanes on the bridge. "Currently, the Jermantown Road Bridge is constructed as a two-lane facility. The bridge, and the segment of the road extending north of the bridge, is located within Fairfax County; the segment of the road extending south from the bridge is located within the City of Fairfax. The jurisdictional line is located directly south of the bridge. The adopted Comprehensive Plan for Jermantown Road (Route 655) does not indicate an improvement for Jermantown Road or the bridge. "The City of Fairfax has expressed interest in improving the segment of Jermantown Road between I-66 and Route 50 to four lanes. The City has initiated the process of amending its Plan to include this recommendation." "The [county] adopted Plan does not currently indicate a transportation improvement for Jermantown Road or the Jermantown Road Bridge over I-66 in Fairfax County. PA 2016-II-T2 considers amending the Comprehensive Plan to show the Jermantown Road Bridge as a four-lane facility." "The Jermantown Road Bridge over I-66 should be planned for a four-lane bridge in order to improve future mobility along the north-south corridor. The bridge improvement should be completed as part of the Transform 66 project. To facilitate the improvement, the bridge should be shown as a four-lane improvement on the Countywide Transportation Plan Map, on the Comprehensive Plan Land Use Plan Map, and in the Area II Plan volume." "Major intersections within the same corridor operate at poor levels of service (LOS), especially in the afternoon (PM) peak hour. The intersections of Route 50 at Waples Mill Road, Route 50 at Jermantown Road, and Route 123 at Jermantown Road all operate at a LOS F in the PM peak hour. Jermantown Road traffic volumes are 17,000 vehicles per day south of the existing I-66 bridge, and 19,000 vehicles per day north of the I-66 Bridge, both warranting four lanes of capacity for the bridge." The Bicycle Master Plan indicates a new bridge crossing and bike lanes on the bridge and there was no mention of the Plan in the staff report. Jermantown Road is a key bicycle access road. A paved trail on the north side of the bridge ends at the bridge. Cyclists and pedestrians are forced onto the road to cross the bridge on a very narrow shoulder. There is likely little or no pedestrian traffic due to the dangerous conditions. Providence Elementary School and Lanier Middle School are both located south of the bridge. The school boundaries extend north of I-66 and most of those students live well within the 1 and 1.5 mile walking distance and could walk to school and avoid having to be bussed. Since widening of the Jermantown Road bridge is not included in the county Transportation Plan, the Fairfax County Board of Supervisors authorized a Plan Amendment to consider planning a four-lane bridge. Public hearings are planned on this proposed Plan Amendment, 2016-II-T2, on Wednesday, November 2, and Tuesday, December 6. We plan to submit comments supporting the building of the bicycle and pedestrian facilities on the Jermantown Bridge. 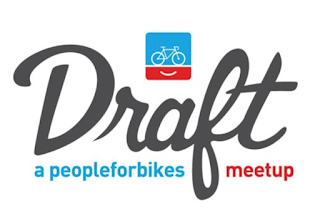 FABB wants to remind members that the People for Bikes Draft Meetup is tomorrow, 18 October, from 6:00 pm to 8:30 pm at New District Brewing, 2709 South Oakland Street, Arlington, just off the W&OD Trail in the Shirlington area. 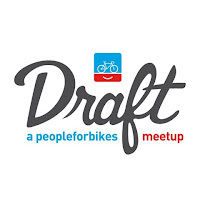 This networking event, co-sponsored by The Bike Lane, is designed to bring passionate people from the local bike, business, and advocacy world together to share information on bike products, events, and other bicycling topics and creative ideas. And, don’t forget that there will be beer and some bike swag for attendees. You need to RSVP using the Eventbrite page here. More information about the meetup is at this Facebook Event page link. as Greg Billing of WABA looks on. Congratulations to WABA for working with the DC Council and Mayor Bowser to advocate for major changes to DC's contributory negligence law. 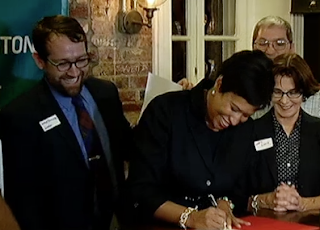 Yesterday Mayor Bowser signed the Motor Vehicle Collision Recovery Act which will allow bicyclists and pedestrians to sue for damages if they are less than 50% negligent. Now only 4 states, Virginia, Maryland, Alabama, and North Carolina have pure contributory negligence, which states that if a cyclist or pedestrian is struck by a motorist and the cyclist or pedestrian was only marginally negligent, then that person cannot sue for damages. For more background on contributory negligence see Fairness for Crash Victims or earlier FABB blog entries that mention the subject. This is a great victory for cyclists and a possible model for Virginia to follow. Now is the time to change Virginia's antiquated contributory negligence law. For an excellent argument for overturning contributory negligence in Virginia, see Virginia Should Abolish The Archaic Tort Defense Of Contributory Negligence And Adopt A Comparative Negligence Defense In Its Place. It's official: Capital Bikeshare will launch on Friday, October 21 in Reston and Tysons. As we mentioned earlier, bikeshare stations have been popping up in Reston lately. We didn't realize that the system would be open in less than two weeks. See maps of the Reston and Tysons station locations. There will be two ribbon-cutting ceremonies, one in Reston at 2 p.m. at the Wiehe-Reston East station and another shortly afterwards at the Tysons Spring Hill station. On Friday, October 21, 2016, Fairfax County elected officials, community partners and county staff will host a two-part ribbon cutting ceremony to celebrate the launch of Capital Bikeshare in Fairfax County. The Capital Bikeshare program will provide residents and visitors short-term, on-demand access to bicycles at 29 stations located in Reston and Tysons, and is part of a regional network of more than 400 stations in the District of Columbia, Arlington County, the City of Alexandria, Fairfax County and Montgomery County. The Fairfax County portion of the Bikeshare system officially opens to the public on Friday, October 21, 2016. Reston: 2 p.m.; Tysons: Approximately 3:15 p.m.
After the conclusion of the Reston celebration, take Metrorail Silver Line (approximately between 2:36-2:58 p.m.) for an 8-minute trip to the Spring Hill Metrorail Station in Tysons. FABB has been working with the county for several years discussing possible bikehsare locations in Reston. Back in 2010, with support from FABB, the county applied for TIGER II funds to implement bikesharing in Reston. They didn't receive those funds but they did receive funds in 2013 to conduct a bikeshare feasibility study in Reston. FABB will be working with the county and with Tysons Partnership to spread the word about bikeshare and to advocate for better bike conditions in Reston and Tysons. The Capital Trails Coalition is a collaboration of public and private organizations, agencies, and citizen volunteers working to advance completion of an interconnected network of multi-use trails for metropolitan Washington, DC. A press event will be held tomorrow, Oct. 13 to announce the formation of the Coalition. The event will take place along the Mt Vernon Trail near the Pentagon Lagoon bridge starting at 10:30 a.m.
FABB plans to be part of the Coalition. The Coalition is currently defining a regional trail network in the Metro DC area. 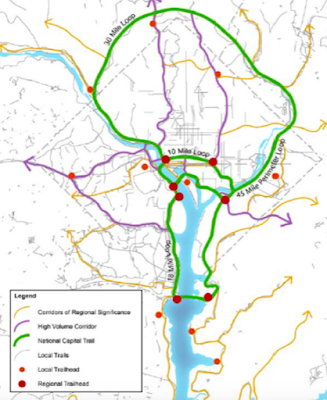 The work is in part an outgrowth of MWCOG's Bicycle Beltway working group (doc file) and National Park Service's Paved Trail Plan. We hope to identify a bicycle beltway route in Fairfax County that would tie together the Mt Vernon and W&OD Trails and would include parts of the Franconia-Springfield Parkway and Fairfax County Parkway trails and the Cross County Trail. Win Free Bikeshare Membership at Tysons Open House next Wed. The free event will be held from 6:30 to 8:30 p.m. at Basis Independent, 8000 Jones Branch Drive in Tysons. Fairfax County and the Tysons Partnership have teamed up to put on this community celebration. “It’s amazing how far we’ve come in the six years since our board passed the Plan to Transform Tysons,” said Fairfax County Chairman Sharon Bulova. “This open house is a festive and informative showcase of the vibrant, urban lifestyle being created in Fairfax County’s new downtown. The newTysons will offer two premier grocery stores, a luxury movie theater, a biergarten, restaurants, food trucks, new luxury and affordable apartments and condos, and new ways to get around, including bikeshare. We've been trying to gather bicycle theft data for Fairfax County. We don't have a good understanding of how many thefts are occurring and where they occur. We've asked Fairfax Co Police on multiple occasions and have not been able to obtain data that we can map. "The daily police blotter is a report put together manually with the creator looking at the exact address and changing it in the Word document to a block number. This is not a field that is readily available." If in digital form, the address could easily be rounded to create the block number. 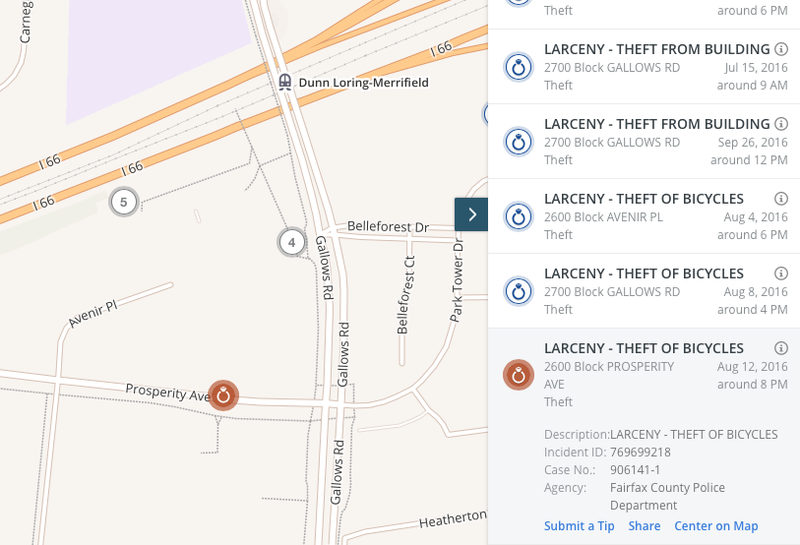 "Theft or Larceny incidents are all categorized the same and listed as singular entries, so larceny is how it is put into the records management system. The item that was taken, in your case a bicycle, is listed separately. ... what it means is to narrow down the search of just bicycle thefts will require a FOIA request. You can make a FOIA request by calling 703-246-2918 or you can email FCPDFOIA@Fairfaxcounty.gov." We were also told that anyone can access this data in map form using an application called CrimeReports.com. Fairfax County supplies data to the system and bike theft data is included. 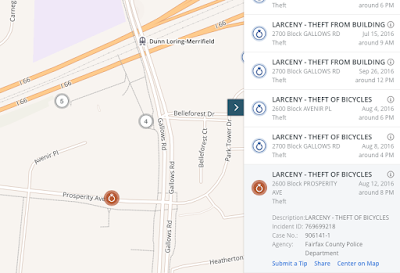 Below is a screen capture of a section of a map showing Thefts in the area around the Dunn Loring Metro station. Three bike thefts are shown during the past 6 months, which is how far back you can search, but only one can be highlighted. If zoomed too far out, no incidents are displayed. Searching is not intuitive. To create the above map I zoomed to the area, clicked on "Filter" under the search window, unselected all and then selected "Theft." Map icons will then show up, either in the form of a diamond ring or a circle with a number inside indicating multiple incidents. On the right there is a dark green box containing: "List <" Clicking on List will bring up the agency. If more than one appears select Fairfax County Police Department. To see the incidents, use the tab at the top next to "Agencies" that says "Incidents." You can then scroll to "Larceny - Theft of Bicycles." If you want to see whether any bike thefts have occurred recently in your neighborhood you can use this application. Since this data is mapped, we're not sure why it can't be released as map data by the county. If we obtain a countywide map of bike thefts we'll publish it here. "The pedestrian and the automobile have equal rights upon the highway, but their capacity for inflicting injury is vastly disproportioned. It follows also from this that the driver of an automobile cannot be said to be using the highway within his rights, or to be in the exercise of due care, if he takes advantage of the force, weight, and power of his machine as a means of compelling pedestrians to yield to his machine superior rights upon the public highway designed for the use of all members of the public upon equal terms." For a driver who has not completely forgotten high school driver’s education, a crosswalk SHOULD be all he needs to see to know that he has to yield or stop for a pedestrian or bicyclist at that crosswalk. Virginia Code and Virginia court decisions for the last 80 years firmly support pedestrians and bicycle riders’ priority “at” crosswalks. Certainly a wishful driver may prefer that motorized vehicles had precedence over an individual wanting to cross at an crosswalk without a signal, but such a driver is being a bully and using sheet metal to intimidate, and probably acts knowing that there are few tickets handed out to those who ignore crosswalks, and perhaps knowing that a pedestrian has limited legal recourse if that pedestrian hazards himself by being hit at all. Pedestrians gave up some rights to use the road, so drivers could go faster between crosswalks and intersections. In exchange for letting drivers go faster, pedestrians received priority at crosswalks. There was a massive social/legal shift in driving rules of the road in the 1920's and 1930's as speeding cars killed thousands of pedestrians, mostly children. Peter Norton's book Fighting Traffic has an interesting review of the many changes in how Americans came to view the streets. A driver sees STOP signs on side roads and reasonably expects cars there are going to remain stopped and not enter the intersection ahead of the driver on the priority road. But wait, you are in a car approaching a trail and there’s a crosswalk painted on the roadway and a stop sign facing the trail users. Who has right of way? If you are not quite sure, you are far from alone. One VDOT survey reported vast uncertainty on who has right of way at WO&D style crossings. Of those responding in a survey, 63 percent thought motor vehicles have the right-of-way; 28 percent thought trail users; and 8 percent did not know.” (pg 61 of Best Practices in Traffic Operations and Safety: Phase II: Zig-zag Pavement Markings) Those numbers are almost unbelievable, but in light of Northern Virginia crosswalk experiences, those numbers may reflect the chasm of misunderstanding and lack of law enforcement support. Who has right of way? Generally the pedestrian/bicycle rider has right-of-way at crosswalks, but the law also imposes a major responsibility on the crosswalk user not to hazard himself by entering in front of traffic too close to stop. Since Virginia is a contributory negligence state, if a pedestrian is hit, she may have real problems collecting civil damages in proving that she followed that part of the law. To repeat, a pedestrian in the hospital with severe injuries MAY have to pay for all her own medical expenses if she is hit, and the driver may have to pay for a new fender. 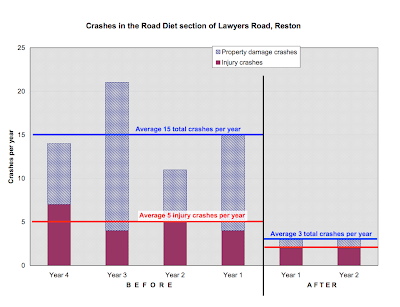 In one Fairfax County crash (Russ v. Destival) referred to the Virginia Supreme Court in 2004, the jury essentially decided in favor of a driver who did not see a bicyclist in a sidepath along Braddock Road and eased his car out into the crosswalk, hitting and injuring the bicyclist who was proceeding through the crosswalk without having fully ascertained the driver had actually yielded the right of way to him. The jury determined the bicyclist acted with some degree of negligence in his crossing at the unsignalized crosswalk. As the court described it, “The right to proceed is to be tested by whether a person of ordinary prudence would attempt it.” Peers on the jury are car drivers. Virginia Code §46.2-924 specifically uses the phrase “at a crosswalk,” in other words the area where the pedestrian is waiting to cross, and not just the striped portion in the roadway. A bicycle rider at a crosswalk can walk his bicycle across OR he can ride it across. In Virginia Code §46.2-904 “A person riding a bicycle, electric personal assistive mobility device, motorized skateboard or scooter, motor-driven cycle, or an electric power-assisted bicycle on a sidewalk, shared-use path, or across a roadway on a crosswalk, shall have all the rights and duties of a pedestrian under the same circumstances.” So to recap: bicyclists are treated as pedestrians when on a trail. To recap, certainly a wishful driver may prefer that motorized vehicles had precedence over an individual wanting to cross at an crosswalk without a signal, but such a driver is being a bully and using sheet metal to intimidate, and probably acts knowing that there are few tickets handed out to those who ignore crosswalks. Capital Bikeshare is the public bike sharing system owned by participating jurisdictions (Washington, DC, Arlington County, the City of Alexandria, Montgomery County, and Fairfax County) and operated by a private company in partnership with the transportation departments of these jurisdictions. The Destination Sales & Marketing Group is the agency of record for Capital Bikeshare marketing for the jurisdictions that make up the Capital Bikeshare system. 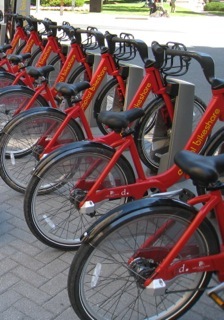 Beginning in October, Capital Bikeshare will expand to Reston and Tysons. Capital Bikeshare Fairfax County Street Team members will staff outreach events in Reston and Tysons to promote Capital Bikeshare to residents, visitors and tourists in these communities. This is a short‐term, hourly position averaging 2 to 6 hours per week requiring work on nights and weekends. This position reports to the Capital Bikeshare Fairfax Outreach Coordinator. Team members work their hours based on scheduled events. While riding along Wiehle Ave near the Wiehle-Reston East station this morning we spotted a Capital Bikeshare truck headed toward the Reston Town Center. We decided to detour through the Town Center to see if any of the planned bikeshare stations had been installed. Sure enough, at the Reston Town Center Transit Station a 17-dock station is now in place. 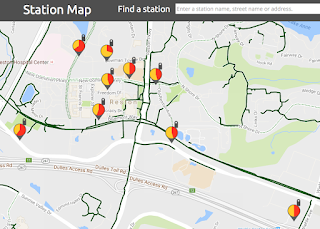 We rode past a few of the other planned Reston stations and found one at Reston Regional Library (15-dock) and at the Wiehe-Reston East Station (35-dock). Those are all locations owned by Fairfax County. You should expect to see the rest of the stations appearing soon. It's exciting to think that bikeshare will soon be a reality in Fairfax County. Kudos to Fairfax DOT, the Board of Supervisors, and others for making this happen. 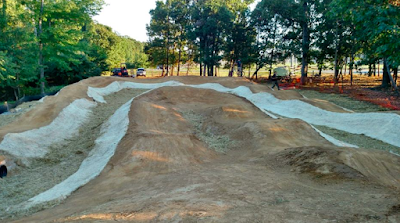 Have you got your pump track/dirt jump bike ready? You better get to it! Construction is happening VERY soon! Thanks to the continued generosity of The Bike Lane and Capital 'Cross Classic along with a huge grant from People for Bikes, we've secured the majority of the funds we need to get this thing built right. Within the next week or two we'll get the dates nailed down and make plans for the official opening. Keep an eye on this page for updates and upcoming events. Fairfax County DOT has been busy installing bike racks at facilities owned by the county. The latest racks were installed this week at Springfield Government Center on Rolling Rd and John Marshall Library in the Franconia area. If you know of a county-owned property in need of a new bike rack, contact DOTbicycleprograms@fairfaxcounty.gov. This father and son duo from McLean spoke to FABB at the Tysons pitstop on Bike to Work Day. Both bike commute to Tysons and also ride to exercise. In response to our question about what they like most about cycling, they agreed that being out “in the beautiful outdoors” is a key attraction. Asked what could be done to improve bicycling in Fairfax County, John joked that he would like to see “fewer hills.” He added that he thought Tysons’ greatest need was better sidewalks. It is not surprising to hear a bicyclist advocate for improved walkability along with better bicycling. People who ride bikes know that better pedestrian facilities encourage people to walk rather than drive and create more opportunities for using bikes for short trips, especially when bike sharing is available. FABB has long been involved in the planning for the future of Tysons, to include this year’s announcement that Capital Bikeshare will soon arrive. FABB also has worked with Fairfax County on the recent additions of new bike lanes on several Tysons roads, new trail links into Tysons, improved on-road conditions in and around Tysons, new bike parking requirements, and improved signage. But, more needs to be done and FABB needs more volunteers to help keep up the demand for better bicycle infrastructure. 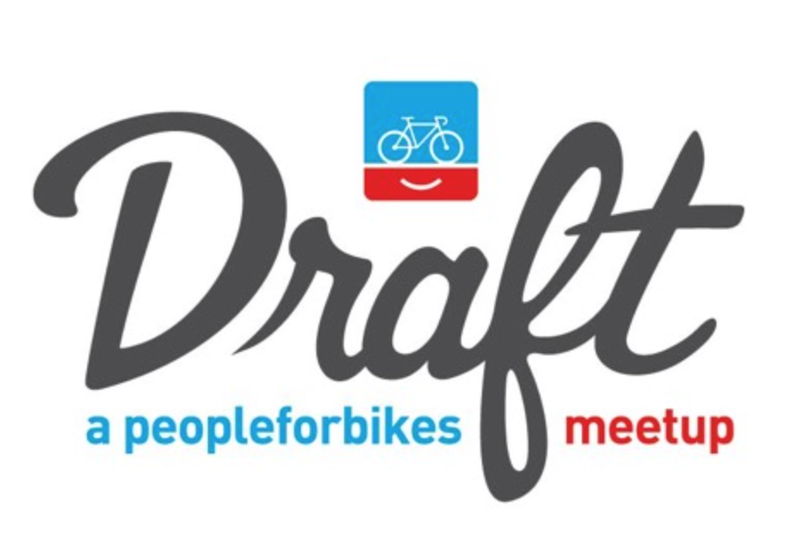 People for Bikes, with help from The Bike Lane, is holding one of their famous Draft Meetups on 18 October from 6:00 pm to 8:30 pm at New District Brewing, 2709 South Oakland Street, Arlington, just off the W&OD Trail in the Shirlington area. Draft meetups, which have been held across the country, are networking events that bring passionate folks from the local bike, business, and advocacy world together to celebrate their individual stories and build on their collective success. At each event, four speakers share short pitches on bike products, events, and other bicycling topics and creative ideas. This idea exchange is designed to help incubate bike businesses, develop entrepreneurs, and improve all things related to bicycling. The event is looking for additional speakers for this and future meetups. If you are interested, apply here. The meeting is open to the public, and biking enthusiasts—that’s you, FABB members—are encouraged to attend to offer their ideas about how businesses can better serve the biking community and make biking better for everyone. There will be beer and some bike swag to create a great weeknight party around the presentations. Please plan on attending this informative and fun event. Beer and banter start at 6 pm and the program begins at 6:30 pm. You can find more information at this Facebook Event page link. You will need to RSVP using the Eventbrite page here. Test Ride More Than 100 Different Models Come test ride more than 100 different models of the latest electric assist bikes from brands such as Blix, BMW, Electra, Focus, Gazelle, IZIP, Kalkhoff, Specialized, Stromer, Tempo (Expo Charity Sponsor), Trek (Expo Track Sponsor), Wallerang, and Yuba, with the latest electric drive systems from Bosch (Expo Presenting Sponsor), Shimano, and more.